Hello, hello hello! It is the beginning of Spring Break here for my youngest, and the weather is windy and cool today in my neck of the woods. I don’t know about you, but this weather makes me want to curl up and read a good book…OR get some of my continuing education units covered! I am currently in need of some engaging, useful, and accessible continuing educating units in the field of speech language pathology and days like these are great to sneak off and try to get some learning in. That’s why I love taking online eSeminars! With four young children, it’s difficult to go to live, in person workshops. 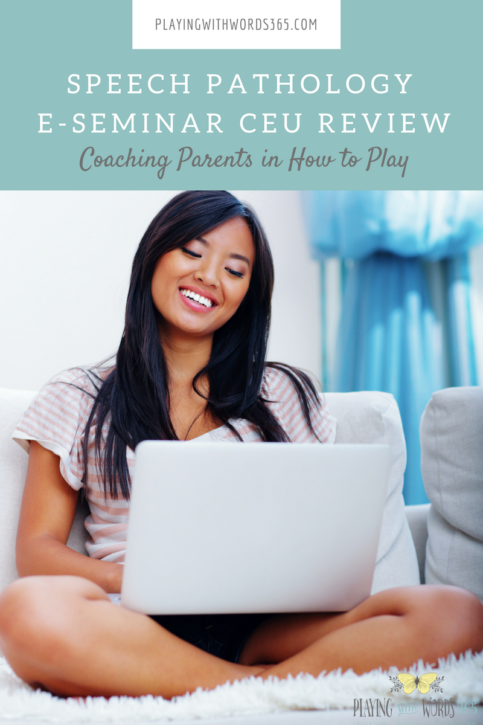 I was thrilled when the people at The Hanen Centre recently contacted me about participating in one of their e-Seminars called Coaching Parents in How to Play. I finished it up last week and I’m here to share how it works and what I thought. Make sre to read to the bottom, as we’ve got a gift for you- you won’t want to miss it! When you sign up for an on demand e-Seminar through The Hanen Centre, you have access to the prerecorded seminar for 30 days. Watch it as many times as you would like, on YOUR time- this is the best part. Especially if you are home with 4 kids and you have to pause it a few times! The e-Seminar also comes with a PDF of the seminar handout, which you can use to follow along and take notes- I printed mine out so I can reference it in the future. For those of you who are fellow speech-language pathologists, these on demand seminars are also eligible for ASHA continuing education units! This e-Seminar offers practical guidance for helping parents facilitate the play and communication skills of their child with autism. While the e-Seminar focuses on children on the spectrum, the strategies presented will be helpful for all children with deficits in the area of play. Coaching Parents in How to Play explores the connections between play, interaction and language at different developmental stages and presents milestones for four types of play: social routines, exploratory, functional and pretend play. Participants learn developmentally appropriate interactive strategies for sharing with parents to help them build their child’s play and language skills during fun play activities. The e-Seminar also offers helpful information on facilitating peer play in children with ASD. Analyze parents’ play-based interaction with children to recognize parental play styles and play scaffolding. Categorize children’s type of play and developmental stage of play guided by major play milestones. Describe specific interactive strategies, drawn from Hanen Programs®, that parents can use to facilitate the child’s play skills for each type of play. Overall, I really enjoyed this course. I found it interesting, relevant, and engaging. At about 2 hours long, it packed a lot of information into a small amount of time, so I appreciated being able to have access to the course for a full 30 days so I could go back and rewatch. I liked that the course provided step by step strategies to teach parents how to meet their child where he is, and help him move forward in play, interactions, and language- which can be applied in practice ASAP. For example- the presenter talks about fostering interaction in young children who struggle with these skills in play. Children who have difficulty with play, or have been through a lot of therapy, may be used to having their toys and objects taken away- and thus can become possessive of them. Because of this, the presenter suggests when you are working on these skills, it’s best when you can each have your own object. Why? Interaction doesn’t come from a power struggle- interaction comes when you’re sharing the same interests. When you each have your own object of the child’s interest- let’s say cars or drums, you can play together and support that child’s play skills without dealing with power struggles. This is SO important! I’ve witnessed many parents and therapists who spend unnecessary time in power struggles with young children, when they can and should be avoided when working on interaction and connection- which are vital to play skill development. You will learn other meaningful and applicable strategies in this course. As mentioned, though developed for kids with ASD, these strategies are great for any children who are delayed in play skills- which we see often in children with delayed speech & language skills and/or other developmental delays. This is definitely NOT just a course for those who work with the ASD population. Anyone who works with young children with delays in play skills should find this eSeminar helpful in practice. I absolutely recommend this course. I finished it wishing there was more! Want to try it out? I’ve got a coupon code for you! The great people at Hanen are giving my readers a 40% discount on this eCourse! Just enter the discount code PLAY365SEM when you sign up for the course. This code is valid until April 30, 2017. You can sign up by clicking HERE. If you’ve followed my blog a while, you may have noticed that I team up with Hanen often. The reason I love Hanen, is because of their child and family centered, naturalistic (teachable moments, everyday moments) intervention strategies and their active family/caregiver roles in intervention. I firmly believe that the first step in building communication skills in young children is CONNECTION, and Hanen’s programs are truly based on connection and relationships. In addition, Hanen also firmly believes in using research to guide interventions, which is also a critical piece for me as a speech pathologist. And no, I’m not paid anything to say any of this 😉 I just really love Hanen! Disclosure: The Hanen Centre provided me the opportunity to view this e-Seminar at no cost, in exchange for my honest review.